Robert Mugabe’s regime has reached the end. Out of money, out of friends, imploding from within – freedom beckons for Zimbabwe. The IMF’s proposed plan to loan Mugabe money is a lifeline that will prolong our suffering and reverse our bid for freedom says Patson Dzamara. Zimbabwe is on the threshold of change. The ruling ZANU PF party, in power for the last 36 years, is crumbling. Everything that could go wrong for them has. Their errors have caught up with them. Abandoned by its friends, out of money, and tearing itself apart through a fierce factional battle over who should succeed President Robert Mugabe when the 92-year old eventually dies, the regime is on the brink of collapse. On one front, Zimbabweans are rising up in thousands. They are fed up with ZANU PF’s dictatorship which has wiped out their savings – so much so, a basic living is impossible. Protests are occurring on an almost daily basis across Zimbabwe, as formal unemployment has skyrocketed and the state stifles the informal sector that keeps our desperate brothers and sisters alive. Empowered by social media spontaneous but strategic, principled, non-violent and non-partisan movements have emerged. They present a new headache for Mugabe. They are not traditional enemies, and they have already landed a huge blow. The mass citizen-led movement has helped push the splintered opposition towards a forming grand coalition. Last week, 18 opposition political parties joined forces for a demonstration to push for electoral reform. The regime – which knows only violence and purchased loyalty – dismisses the rising tide of anger as “popcorn protests” even as it marshals the full might of the military to try and suppress them. Internally, ZANU PF is at war with itself. The center cannot hold. Robert Mugabe faces stiff resistance from familiar forces, and ones he has relied on in the past. Joice Mujuru, the protege turned protester. Emmerson Mnangagwa with the might of the war veterans and the military, and his own wife Grace serving to further widen the divides. All this have been powerful allies, they may perhaps prove to be equally powerful enemies now. A disjointed Zanu PF and an alienated Mugabe do inspire as much fear as before. With the potency of fear weakening across the country, the regime’s only other tool to buy support – patronage and access to resources – is no longer available. The nation’s coffers are empty. The country is bankrupt. Diamond revenues – which vanished almost as soon as they were created – have now dried up. The Chinese government has stopped providing condition-free loans. The military has now gone unpaid for months and some soldiers have joined the protests. This is the weakest the regime has ever been. This is the closest we have yet come to freeing ourselves from its kleptocracy and violent rule. And this is why we are deeply concerned about the apparent decision by the international community to facilitate the restructuring of Zimbabwe’s debt to allow new loans to the regime. The government has racked up almost $7 billion in debt. In 1999, it stopped paying its debts and so cannot borrow any more money. It desperately wants to make a deal that would clear its arrears – some $1.8 billion in total – thus removing the main obstacle preventing new loans from the World Bank, International Monetary Fund (IMF) and African Development Bank. If news reports are correct, the process of clearing the outstanding debt is almost complete and the regime looks likely to receive a major financial boost. A Cairo-based bank, the African Export-Import Bank (Afreximbank) and Lazard, an international asset management and financial advisory firm, have apparently reached a deal to mobilise $1.1 billion in additional loans to repay the outstanding debt to the World Bank. Once the arrears are cleared, Zimbabwe will be able to borrow from the IMF, the African Development Bank and the World Bank. Reports are that these institutions will be meeting in a month to approve other aspects of the debt payment plan, laying the basis for funds from these institutions to flow once more into the regime’s coffers. It’s not clear what has suddenly changed and why this has influenced the renewed interest in funding Zimbabwe. Implausible as these arguments are, it seems on the face of it that the re-engagement is based on a perceived change of heart by the Mugabe regime and a commitment to change. The evidence for this is scant. This government in the past few months has embarked on a well-documented ruthless campaign of police brutality to shut down non-violent citizen protests. The president spent a reported US$800,000 on his birthday celebrations this year, even as the World Food Programme says that over a third of Zimbabwe’s children are now stunted in growth due to malnutrition and an El Nino induced drought threatens to push millions into starvation. The deputy president has been living in a five star hotel at a cost of US$400 a night for over a year and a half while vegetable vendors cannot scramble together a few cents to take public transport home and end up sleeping on the streets. The proposition that the regime is restoring financial sector confidence is simply not true. The disappearance of liquidity has destroyed our financial sector. A new record was broken in July, when the trades on the stock exchange amounted to just US$105 on one day. The regime’s latest plan to rob citizens in broad daylight through the introduction of illegal “bond notes” has already damaged public confidence in its economic logic, with even more cash disappearing from our financial markets. A similar stunt by the government led to the nation’s crippling economic crisis in 2008. As citizens, we know we will bear the cost of the new debt being imposed on our country. And so we deserve to know what secret negotiations are being conducted and by what right the regime believes it represents us. This is because our trust in our own government is fundamentally broken. There has been no meaningful public consultation whatsoever as all this wheeling and dealing has taken place. For the most part, Zimbabweans remain in the dark. Despite earnest ‘reassurance’ from some quarters that there are no new financing programs under discussion, the Minister of Finance and central bank governor have gone on record stating that financing deals are under way. What are the terms and conditions for the loans? What collateral is the government offering? Where will the funds be transferred? More importantly, how will the lenders ensure that funds aren’t used to purchase arms or politicize distribution of food aid as has happened before? Why then would these financing institutions want to strike a deal with such an obviously corrupt government? Perhaps they are concerned that they will have to pick up the tab if Zimbabwe implodes from the ongoing crisis. But they are deeply mistaken if they think that propping up the current regime will bring stability to the country. It will impose an uneasy peace and entrench the corruption, poverty and injustice in which we have been mired for so long. For some of us the cost of this regime’s brutality is personal. 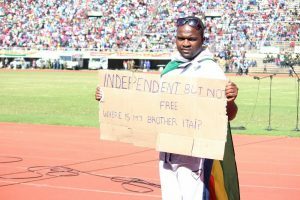 In October 2014 my brother, the activist Itai Dzamara, began a one-man protest at Harare’s Africa Unity Square. He delivered a petition to Mugabe’s office calling on the nonagenarian president to retire. A few months later, Itai was abducted by suspected state security agents and has been missing ever since. Local and international pressure to release Itai has been consistently ignored by the regime. This is exactly the type of horrific human rights abuse we can expect to continue if the international community perseveres with its plan to back the regime through the extension of loans to the government. Funding this government will only deepen the regime’s contempt for citizens’ legitimate demands and prolong its well overdue extinction. Maintaining status quo is simply not an option for us. The onus of bringing freedom to Zimbabwe rests squarely on the shoulders of the Zimbabwean people. For almost four decades, the international community has watched Robert Mugabe wreak havoc on his people. They have ignored the screams of Zimbabwe’s children; they have turned a blind eye to the rivers of flowing blood. Now things have fallen into place for Zimbabwe and Zimbabweans to reclaim their freedom. Robert Mugabe has entangled himself. His excesses, and his regime is drowning. The last thing the forgotten children of Zimbabwe need is for the regime to be thrown a lifeline. The world forgot us, and right now, the least we can ask is that they do not prop up our oppressor, and saddle our children with further debt, just as we begin to gain the upper hand. Hatichada. Hatichatya. We are fed up and we’re no longer afraid. Enough is enough. Dr Patson Dzamara is a human rights activist living in Zimbabwe. Article appears on Khuluma Afrika – center for political analysis and commentary.